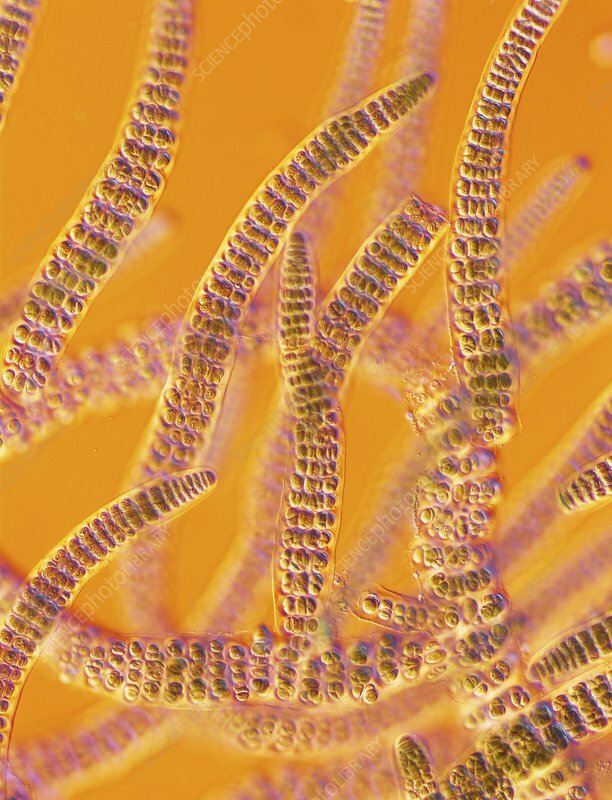 Light micrograph using differential interference contrast microscopy (DIC) of the filamentous blue-green algae (group name Cyanophycophyta), called stigonema. Blue-green algae are considered to be one of the most primitive organisms, dating back to pre- Cambrian times. A single row of cells such as one of these strands, is called a trichome. When surrounded by a gelatinous sheath it is called a filament. Oscillatoria lacks a slimy sheath. The strands of Oscillatoria exhibit a swaying motion and can also move backward & forward. Horizontal object size: 0.6 mm.